Brimming with sophisticated charm, the Mid-Century Oval Ottoman with Wood Legs from HomePop represents the best of mid-century modern design " perfect for incorporating into your stylish abode. 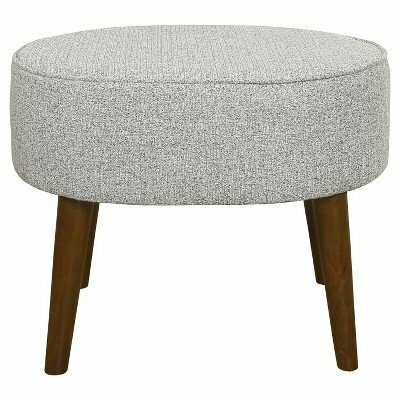 Comfortably cushioned and supported by graceful tapered legs with a wooden construction, this gray oval ottoman will fit right at home in your living room, vanity area or office. Craft a luxurious modern dwelling by placing this ottoman in front of a tufted sofa, and complete the look with a patterned rug, wooden credenza and end table.